Opening Reception Saturday, March 21 6—10pm. 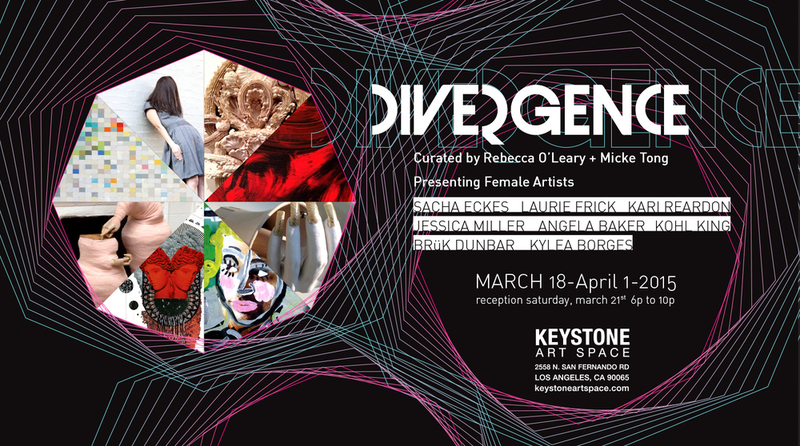 Divergence is an exhibition of work by 8 contemporary female artists working in distinctly different mediums. Curated by Micke Tong and Rebecca O’Leary, Divergence spotlights artists who are working in an interdisciplinary manner, integrating unique methodologies or concepts into their artistic practice. The artwork exhibited is of varied styles and genres: conceptual art, abstract painting, ceramic sculpture, mixed media and photography, providing a widely spread artistic experience for the viewer. In their practices, these artists have subtly but bravely emerged out of the veil of restrictions and limitations of traditional mediums and found their own path to making unique works of art. Presenting Female Artists: Angela Baker Brük Dunbar Sacha Eckes Laurie Frick Kohl King Jessica Miller Kylea Borges and Kari Reardon. A native of Philadelphia, Angela Baker received her art education in Lawrence, Kansas and Columbus, OH, graduating with a Bachelor of Fine Art from the Columbus College of Art and Design in 1993. Bakerʼs paintings combine disparate elements in order to observe the interplay. After applying an even ground of color, black calligraphic marks are made on top, exploring the relationship between opposites: translucent and opaque, glossy and matte, fast and slow mark making. Baker was nominated for a SECA (Society for the Encouragement of Contemporary Art) Award in 2012. Her work has been exhibited in both group and solo shows in the U.S. and Hungary at the Alpan Gallery in New York, the George Lawson Gallery in San Francisco and Los Angeles as well as the Vizivarosi Gallery in Budapest, Hungary. The parallel universe of Sacha Eckes operates according to a set of rules all its own. Its denizens seem to function in a constant state of failure, where success is measured by perversity of outcome. In this alternate world the dogmas and assumptions of our own world come in for a thorough drubbing – usually delivered lightly and with a kind of twisted grace. Sacha Eckes received her MFA in Fine Arts from Saint Lucas College of Art, Gent, Belgium. Although currently a resident in Antwerp, Eckes has spent time developing her work in the cities of Detroit and most notably San Francisco where she founded the almost decade strong, live drawing monthly, “Sketch Tuesdays” at 111 Minna Gallery. Eckes’ work has been presented in New York at Lyons Wier Gallery, New Image Art in Los Angeles and Fouladi Projects, San Francisco. Kohl King was born in Bangalore, India and immigrated to the United States at an early age. She earned her Bachelor of Fine Arts in Drawing and Painting from the University of Georgia, a Master of Fine Arts from the University of Arizona and studied Conceptual and Installation Art at The Cooper Union School, New York. Her work is drawn from psychology---primarily understanding and resolving relational natures. By combining non-traditional but symbolic materials she creates situations where relationships between the various elements can either co-exist independently, symbiotically, parasitically or at times, reflect their determined conflicting states. For her, the work is a direct interpretation of how she navigates, internally and externally, in the world. She does not believe in randomness and is a big fan of the math and sciences as further validation of the spiritual. Jessica Miller was born in Bangor, Maine. In her teens she passionately pursued photography making Goth photos in the graveyard, which led to working for newspapers as a photojournalist, to shooting popular culture, in turn, leading to commercial photography work. Her images have been featured in the Guggenheim Museum's Stillspotting project, LA Flash project for the Los Angeles County Museum of Art, and in Photo District News. In 2011, Miller was the recipient of a $10,000 award given by Illy coffee for her project Facade, which highlighted the malleability of the human form by juxtaposing it with the rigidity of urban architecture. Jessica earned an MFA in Photography, Video & Related Media from the School of Visual Arts in New York City, a BFA in Photography from the San Francisco Art Institute, and a BA in Psychology from Randolph-Macon Woman's College. She lives in Brooklyn with her husband and her dog, Trixie. As a ceramic artist, Brük Dunbar has a connection to raw earth and the things that come out of soil. To her, these things are a phenomenon of nature that is felt and heralded. Growth patterns and the movement of growth are realized in her sculptures. The current climate of farming, consumption, and genetically modified products all tend to be themes investigated in Dunbar’s work. The investigative process continues by working with maps, magnifying countries into cities, cities into neighborhoods and down to the house, it's foundation and eventually it's pipes that extract in similar vein-like formations, as do roots from the soil. Brük has exhibited most recently at Zughaus Gallery in Berkeley, California, Dalet Gallery in Philadelphia, Pennsylvania and graduated from California College of the Arts in San Francisco with a BFA in Ceramics with High Distinction. This year, 2015, she will take on the new title of Gallerist and co-founder of the newly established Dimond Mine Gallery situated in Oakland, California’s Dimond district. Laurie Frick is a data artist exploring patterns of self-tracking…sensors, surveillance, what will it all mean? Using her background in high-technology she offers an alternative view of privacy and a glimpse into the future of human data portraits with handmade installations from her personal data. She realized those same rules could turn data into art on your phone. “Everyone is tracking you. It’s your life, it’s your data, why not turn it into art?” FRICKbits was crowdfunded with a successful Kickstarter campaign in 2014 and is now available in the Apple store. She holds an MFA from the New York Studio School, an MBA from the University of Southern California and studies at New York University’s ITP program. Frick recently was awarded residencies by Samsung Research, Neuroscience Research Center University of Texas, Headlands and Bemis Center. Frick’s talks and publications include Nature Publishing, Los Angeles Times, New Scientist, NPR, Creative Mornings and a TED talk at TEDxAustin. She has widely exhibited, with solo shows in New York, California and Texas. She is represented by Edward Cella in Los Angeles, and has an upcoming exhibition in 2015 with Pavel Zoubok in New York. Thumbs are replacing our tongues and forming new languages through our media-centric world of constant communication, via texting, Facebook, Twitter and instant messaging. Technology has changed the way we relate, identify, communicate/miscommunicate. By distorting the inherent meaning of found objects and shifting scale, Kari Reardon plays with constructs and identity to point to the absurdity of our ever growing virtual experience. She conjoins dreams, childhood memories, and pop culture references in a somewhat dark and humorous way to point to the surreal existence of our technological new norm. Kari Reardon is a Los Angeles based artist originally from Minneapolis Minnesota. She received her BFA from the School of the Art Institute of Chicago in 1999 after studying at the Studio Arts Center in Florence Italy and completed her MFA in 2012 from the California Institute of the Arts. Kari has been a recipient of numerous grants, residencies and fellowships throughout the US and internationally. Currently she has a studio in Mount Washington and teaches bronze casting and beginning 3-D design at California State University Northridge. Kylea Borges brings together her observations from nature and textiles, and marries them in an elegant dance of natural geometry. Her process, for the most part, is experimentally organic and inspired by her avid collection of antique objects. By sourcing together vintage imagery and paper, Borges painstakingly weaves, draws and repeats paper cut outs adding a surplus of layering to her collage work. Kylea’s artistry of textiles and design has greatly contributed to the aesthetics of her artwork. She personally has described the themes of her art as having “fragility, unity, celebration and altered perspectives”. A long time California native, Kylea Borges creates and resides in city of San Francisco. Most recently, she has been featured in Juxtapoz Pychedelic as one of the many contemporary practitioners of the neo-psychedelic movement published by Gingko Press. Borges’ work has been exhibited in San Francisco at Mina Dresden Gallery, Eleanor Harwood and RVCA as well as abroad at V1 Gallery in Copenhagen. Gallery Hours Tues-Friday 1p-6p & by appointment.